Juneathon Day 3 – A Run at last! After 2 days of ‘allotmenteering’ I though I’d better make it out for a run. I’ve not run for about 10 days, so thought I’d just do a short 3 miles and enjoy the sun. Sunny it was for sure! Beautiful out there, and I was out early enough that it wasn’t hot. I ran my usual 3 mile loop, which is a very handy loop from my driveway, out of the village, down a little lane, down through a field, then back up along a by-way, back up along a tiny lane, and along a different lane back to my house. A completely circular route that measures exactly 3 miles. Funnily enough, its the route I used to aim to be able to run when I started running, 4 years ago. I used to dress in jeans, baggy t-shirt and cheap trainers and walk until I was far enough away from the village that no one would see me. Then I would run for as far as I could (not very! ), then walk until I got my breath back. I’d repeat this until I was back into the village again when I would walk (in case anyone saw me). Not sure why I was so worried about anyone seeing me – this morning I was out in my tight lycra shorts and top. I have obviously passed the age of caring! Other things that have changed – at the top of the field was an old stile that I had to climb over. 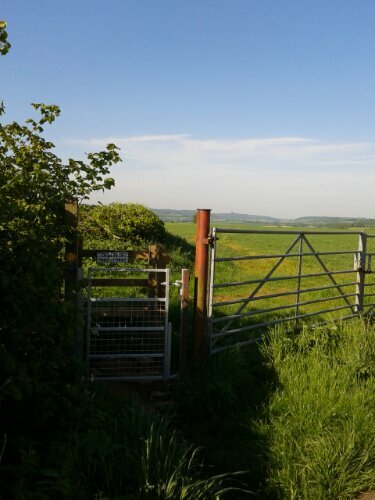 I used to puff and pant (walking) my way up the field, looking out for this stile which was the sign the hill had ended and it was flat all the way back. Now I run this route the other way round, the stile is often where I pause for a view down over the valley (and occasionally some hares in the fields). This stile is where I first saw some badger tracks in the snow in January. It is also where I demonstrated how clumsy I can be trying to copy someone who niftily climbed through the stile rather than over it. I managed to fall through instead – I never tried that one again! At least I’ll struggle to fall through this one ….?! Certainly a bit less chilly!